Your library of re-usable content if the session is recorded. There are a number of solid webinar services available online for hosting webinars. The best offer a full suite of features, each of which will help you plan, create, schedule, promote, run, and follow-up on your webinars. To help you find the solution that’s right for you, we’ve compiled a list of webinar services for small business owners. Recording – once you record a webinar, you can offer it over and over to attract, educate and entice your prospects. Cutting edge webinar services – live streaming is hot and these tools help you do it right. It’s important to note that the number of webinars you can hold per month and the number of people who can attend each webinar can vary greatly from solution to solution, even within the “top of the line” category. Before committing, make sure that the webinar tool you like can meet your demand for both. Some of the webinar services for small business in this section are well known however, there were a couple of surprise contenders are well. One of the most well known webinar tools on the market, GoToWebinar offers it all at a price that’s reasonable for what you get. The company sweetens the pot by offering a free subscription to their popular web-meeting service, GoToMeeting, as part of the deal. Another big contender in the webinar services space, WebEx Event Center is chock-full of all the webinar goodies you need to market your business online including multiple video feeds. Known more for their design applications than for webinars, Adobe offers a fairly complete package with its Adobe Connect Webinars tool. Less well known, though just as robust as the webinar services above, AnyMeeting offers a number of plans, most of which include the features you’d love to have. 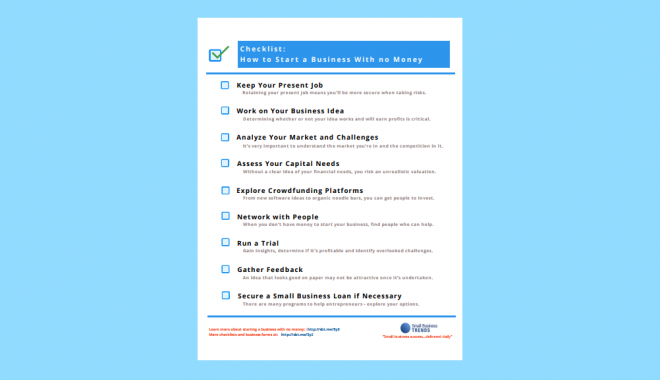 They’re also focused on small businesses which means that they may understand your challenges better. One thing that’s weird however – they don’t offer screen sharing on the higher-attendee plans. Perhaps it’s a matter of bandwidth but that’s definitely a ding against them. 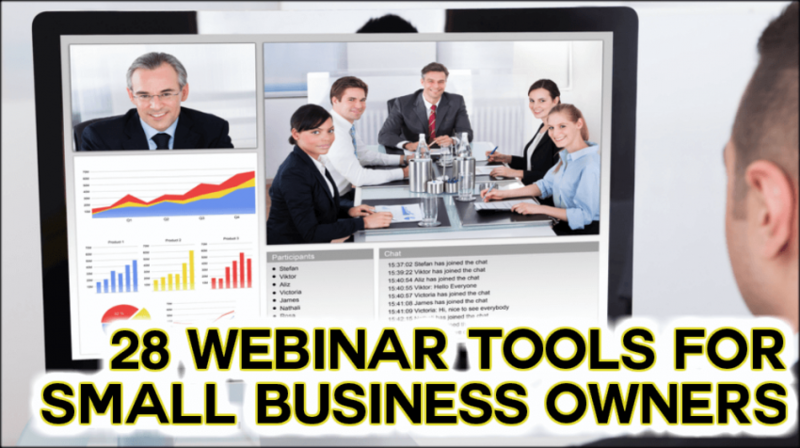 Offering almost all the features you’ll need, ClickWebinar is a robust solution with a lower price tag so be sure to check them out as an option for your small business webinars. Though not a well known webinar tool, Onstream Webinars offers a fully-loaded package at a lower price than most. For that reason alone, they’re certainly worth a look. Our final top of the line webinar tool, ReadyTalk offers a robust set of features that integrate with many marketing automation systems. Be forewarned, the “budget” in this sections header often means a lower price however, that’s not always the case. 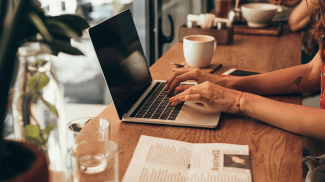 The webinar services for small business in this section are a mixed bag, offering a wide variety of features and functionality so make sure a tool fits your needs before committing to it. Thanks to their free online meeting service, Zoom has become quite popular. Not many people know that they also offer a video webinar service that can handle up to 3,000 attendees. Also known for its free meeting offering, Join.me offers a webinar solution for up to 250 participants. 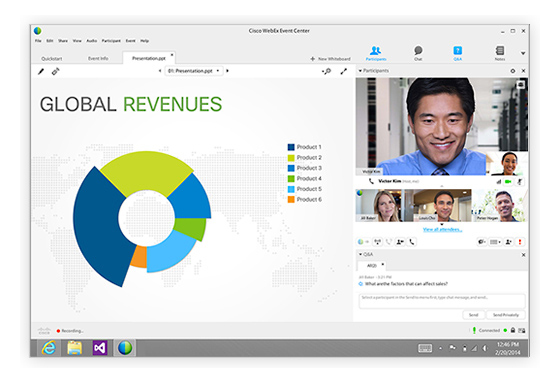 Webinars OnAir is a suite of webinar functionality built around Google+ hangouts. In other words, the tool adds the features and functionality you want that Google+ hangouts is missing. The best part? Thanks to Google+ hangouts free price, Webinar’s OnAir is inexpensive. 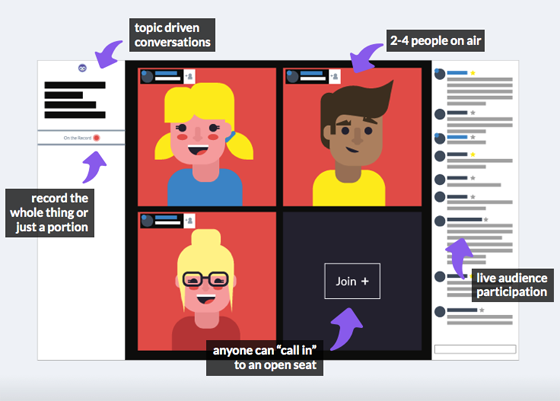 Another webinar tool built around Google+ hangouts, WebinarJam offers amazing features and functionality for a very low price. This is definitely one solution to check out. If you’re looking for a well-priced basic entrepreneur webinar tool, then EZTalks may be the solution for you. Primarily a videoconferencing system, they offer webinar-sized plans as well. One of the more robust budget webinar tools, Yugma offers plans that might fit your budget. If you only plan to share your screen and not a video feed, then GatherPlace is worth a look. They focus on screen sharing over video conferencing and offer a nice set of features as well. ON24 offers a good set of webinar features and functionality, even some tailored for marketing webinars. Unfortunately, they do not list their prices online so you’ll need to contact them to find out how much the solution costs. iLinc offers another good set of webinar features including integration with Salesforce CRM. Once again, we could not find any pricing on this site so contact the vendor if you’re interested. Last but not least in this section, Webinars on Fire offers a solid set of features for a very attractive price. What’s more, owner Gary Jesch seems to be very hands-on, something that many of his customers seem to appreciate. The webinar services for small business in this section are like the solutions above except they offer one thing more: automation. Small business folks love automation because it saves them lots of time and effort. In the case of webinars, the trick is to make an automated webinar seem live, functionality that each of the tools in this section offer. Imagine: recorded webinars that attendees need to register for just like a regular event. When the event time arrives, the webinar kicks off, offering the same information and offer as it did the first time around except, you’re not there. You’re doing something else to advance your business and that’s where the power of these solutions really shines. Stealth Seminar claims that it offers the “Only Automated Hybrid Webinar System on the Planet”. What this means is that you can automate the webinar and then go live during the Q&A session at the end. Or, you can start live, kick off an automated presentation and then comes in at the end. How cool is that? If you want to turn your recorded webinars into a constantly available stream of content, then EverWebinar is worth a look. Not only can you automate your webinars with this tool, you can also hold “Just In Time Webinars” that kick off right after a prospect registers. They also offer a robust scheduling system that automatically assures that your webinar does not run at a weird time, such as the middle of the night. Yet another automated webinar system, OfficeVP even offers a payment gateway for people to attend your webinars. Auto Webinar Player focuses on recorded webinars only. Once you hold your webinar, you upload its recording to their servers to schedule automated times for it to run again and again. Webinato is a full-featured webinar tool that also offers Autopilot, “AutoPilot replays the session with all its interactivity! 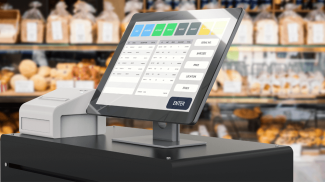 Attendees watching an AutoPilot replay will not miss a beat and can fully interact through chat, polls, documents folder, etc as in a live session.” Now that’s useful! Be able to take advantage of an actual offer with genuine urgency. The webinar services for small business in our final section highlight the growing power of easy-to-use live streaming solutions that may one day replace the webinar as the hallmark of online interaction. 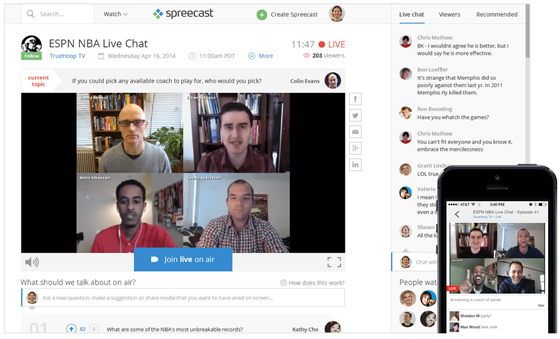 Spreecast is a robust live streaming tool that lets you display a video feed while interacting with your watchers via chat. 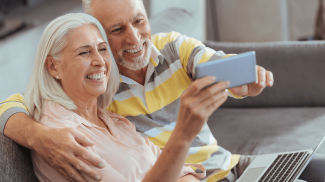 You casts are recorded and saved for future viewing – you can even embed them on your website. Blab is like a talk show that your audience can tune into and watch. Better yet, they can participate as well. As you can see from the list above, there are many webinar services for small business owners available. The key to avoiding overwhelm and finding the solution that’s right for your business is to head into your search prepared – if you know what you want, and what you don’t need, you’ll be able to trim down the list of appropriate webinar tools quickly. Out of the bunch, I have used Join.Me. I have even used it to train some staff members remotely. I think that more than holding webinars, it is also a really good tool for training. Wow! Awesome list of options for those of us planning on webinars as part of our marketing funnel and plans. Thanks for your efforts. Thanks for putting this comprehensive list together, Matt. I’m going to check out a few of the lesser-known ones. Cost- I don’t want to pay annually…just one at a time. Technology- I’m seriously worried about tech glitches. They seem to happen frequently on webinars. Matt: Which webinar tool is best together with social media activities? Matt, great list! The AnyMeeting team hears you and our customers — and don’t fret — we’ll be bumping up the screen sharing capacity soon! Also keep an eye out for some other amazing innovations coming soon as well. Thanks for putting this together! I think that having webinars is a nice way to not only promote your brand but also to prove your expertise. It is a great way to get lasting connections. Thanks for the list. I was thinking of having a webinar for my readers but it seems to be so hard. I will look into the tools that you have listed. Another very good webinar tool is: R-HUB web conferencing servers. Thank you. This is a great list. I found what I need with out spending $10K for a customized tool. Spree cast, and Blab look like they might be good for our mentoring program: one mentor and girls online at different times asking mentor a question. Good halfway progress, but this article will become actually helpful when detailed information is presented in a table, showing by X’s which platforms have which attributes. Remarks like “chock-full of all the webinar goodies you need” just add noise.